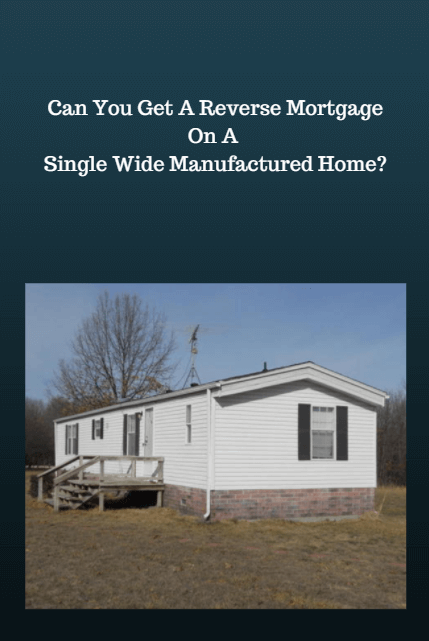 Home » eligible for a reverse » Can You Get A Reverse Mortgage On A Single Wide Manufactured Home? eligible for a reverse mortgage, but not all of them are. Do you have a single wide manufactured home? Are you age 62 or older? If so, you may be wondering if you can get a reverse mortgage on a singlewide manufactured home. Well, the answer is “yes”……….. and “no”. While FHA / HUD will insure reverse mortgages on singlewide manufactured homes, not every lender will do it. Roughly only 20% of reverse mortgage lenders will fund a reverse mortgage for this type of property. So, if you are 62 plus and own a single wide, the first question you should ask a lender, broker, or loan officer is if they do reverse mortgages on singlewide manufactured homes. Make sure to let them know it’s a singlewide too. It’s a little easier to find a lender that does a reverse mortgage on a double wide, so make sure you distinguish. This post is not intended to go over the requirements that pertain to income, credit, etc.. The following is just a quick look at the most basic criteria required for your property. You should also note that while we’re specifically talking about single wide criteria, they’d also apply to double wide homes as well. Remember, the lenders that do reverse mortgages on single wides are fewer and farther between vs it’s double wide counterpart. The tongue and axle must be removed and you must have a permanent foundation. Title must be purged and your single wide manufactured home must be taxed as real estate (vs personal property). You must own the land that your single wide manufactured home sits on. You can’t rent the space (like in a mobile home / manufactured home park). Manufactured Homes built prior to June 15, 1976 are ineligible. However, some lenders have additional rules called overlays. For example, some might not offer a reverse mortgage for manufactured homes that were built prior to 1990. The home cannot move from it’s original site. Obviously, it can be moved from the dealership to your home site, but it can never move from one parcel of land to another. Your manufactured home cannot be in a flood zone to qualify for a reverse mortgage. All sections must have an affixed HUD label (tag) located on the outside of the home. Once your home is appraised and the loan has a preliminary approval, you’ll need an engineer’s certification attesting to compliance with the Permanent Foundations Guide for manufactured Housing. If all this applies to your single wide manufactured home, then there’s a good chance you may be eligible for a reverse mortgage. Naturally, you’ll need to meet the age, equity, credit, and income requirements.